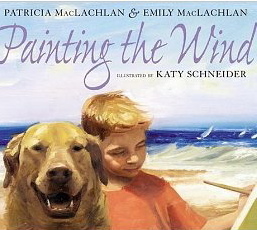 I became familiar with this book Painting the Wind at a session I attended at the NCTE conference and immediately went home and ordered it. 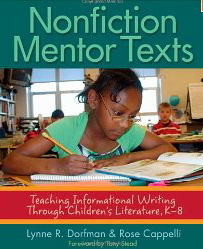 Rose Cappelli shared some ideas for using this text with student writers. I emailed Rose to make sure it was OK to share her lesson with our readers in hopes that teachers can take it and make it their own. Thanks Rose for saying YES! 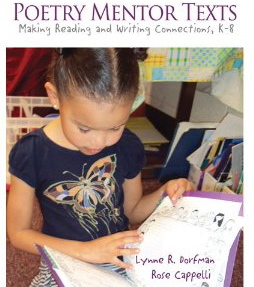 Rose and her writing partner Lynn Dorfman have written several books (Mentor Texts, Nonfiction Mentor Texts, and Poetry Mentor Texts) filled with dependable classroom ideas that work well with a variety of grade levels. Hook the students with a great children’s literature that invites participation. This format echoes all those other “greats” who also write about supporting student writers– from Calkins to Fletcher to Katie Wood Ray to Georgia Heard. Here is what Rose did next. She mentioned a passage from John Henry by Julius Lester and another from James and the Giant Peach (where the aunts are getting run over by the peach.) Both passages have a long rolling sentence with lots of motion followed by shorter sentences. Rose asked the audience as she does with her students, “What is something in real life that has that fast, fast movement and then all of a sudden… stops?” The kids brainstormed: recess, various sporting events, getting ready for school, etc. I think you can see how brilliantly Rose’s lesson would entice students to want to take a look at their own written pieces to see if varying their sentence length could spruce up their writing. Thanks Rose for sharing your lesson idea! Be sure to check out Rose and Lynn’s new book on Poetry. They both lay on the ground, fighting and clawing and yelling and struggling frantically to get up again, but before they could do this, the mighty peach was upon them. They both lay on the sofa bed, curled up and cuddling, San Juan purring and Kayla crying, both of them trying to forget what was happening, but before they could, the moment was upon us. I got the cat carrier. We put her in it. Thanks for this example, Vicki. I’ve been searching everywhere for my copy of James and the Giant Peach. So many teachers are afraid to write in front of their students. I think examples like yours and Rose’s show them that it’s not so difficult after all. Showing how we all can borrow ideas from other authors is so powerful!